Chloe started telling me waaaay back in June that she was going to be a Christmas Tree for Halloween. I laughed and told her that was a great idea! Little did I know that she was not going to give up on her brilliant idea. As fall approached and I started looking for costumes for the kids, Chloe insisted that she needed to be a Christmas tree. 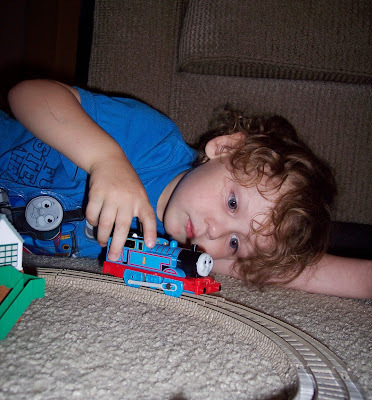 Bradley, of course, was easy - I found a cute Thomas the Tank Engine costume online and it was shipped lickety split. I tried to convince Chloe to be one of the other cute costumes I could buy, already made. I offered every princess, fairy, animal.... None would appease her. She explained how much she LOVES Christmas and Christmas trees. She was special and would be so so sad if she couldn't be a Christmas tree. So after the excitement of Bradley's party died down, I got to work. 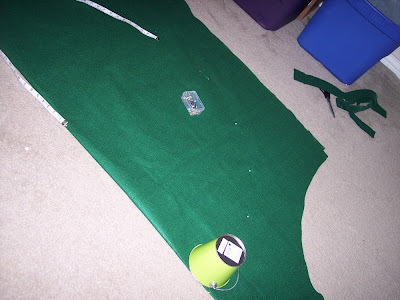 And, of course, I'll share with you how to make your very own Christmas Tree Costume. 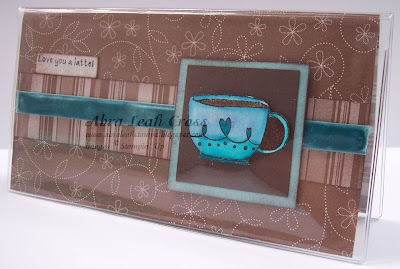 It's the season of Thanks, and Shelli Gardner (of Stampin' Up!) has a contest on her blog that asks us to craft something that documents what we are thankful for. You can visit Shelli's blog HERE. I was already working on a little project, so I'm going to enter it in the contest. After an getting up early in the morning, not taking a nap, and enjoying a wild party, this three-year-old boy knows how to wind down. Monday evening I thought I was coming down with a sinus infection, so I went to the doctor and he prescribed some antibiotics. Tuesday I felt okay in the morning, but was getting tired by the afternoon. I was exhausted by the time for our normal Wrangling the Children to Bed routine. 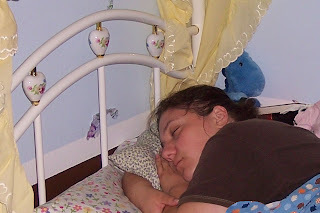 I even fell asleep in Chloe's bed while Mike was finishing up with the kids' bath. Mike thought it was funny, so he took a picture. Ha ha. My first question was, You took a picture of me while my children were in the bath ready to drown while not attended?! But, he took it after they were out of the bath and doing the potty routine, so no call for a hangin'. I had my first craft fair in my new neighborhood on Saturday and it was loads of fun! Not only did I have some great sales, but I met some darling women all interested in stamping and scrapbooking. I'm working on the little note cards I'm sending to everyone who entered my door prize, I'll share one later this week. 31% of pregnancies end in miscarriage. Many of these happen so early in the pregnancy that a woman might not even know she miscarried - these are more commonly known as "chemical pregnancies." But, chances are with this percentage rate you or someone you know has probably suffered this loss. I had my first miscarriage July 2, 1999. Thus began my long journey through infertility, loss, and miracles. I had several subsequent chemical pregnancies, and 3 more miscarriages. Although I now am Mommy to my two darling children, the pain of pregnancy loss is still quite raw for me. He's the #1 Blue Engine, don't ya know. 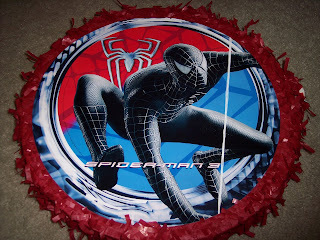 When Bradley turned two last year, my friend Natalie bought this for him. Thus began a love affair like our house had never seen. What started out as one little "twain" with a house turned into two twains, because Thomas needed a friend. 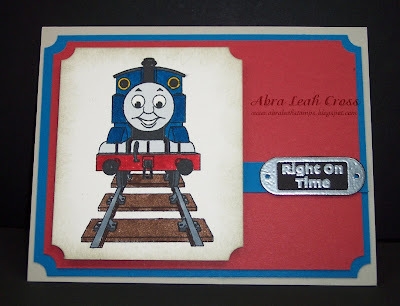 So, Thomas and Percy and Bradley were total BFFs. Then Chloe wanted a girl train, so Molly entered the picture. And then I had to get more track, because seriously - that roundhouse did NOT come with enough pieces to build cool cool rail systems. We are now the proud owners of pretty much all the major engines (Who needs those stupid ol' diesel and narrow line engines? Psht! Not us! Steam all the way, baby!) We are lacking Edward, Henry, and Toby of the Major Eight. Molly isn't a major character, but she was the one Chloe wanted first (she has Emily, now, too). Even Mike has his own Gordon, and the kids always argue over who gets to play with "Daddy's Train!" There is this great place just west of Houston called Dewberry Farm - they have all kinds of amazing Fall activities for kids, including a pick-your-own pumpkin patch. We've been taking the kids for the past 3 years and we all love it. If you live in the Houston area I highly recommend you take a little trip out there. We usually go in the evening when it's not as crowded and the weather is a bit cooler. And here they are with all three of their cousins this year. I swear I took this picture 8 times and not ONCE are all of the kids looking at the camera! The second year we went Bradley was just beginning his tractor obsession (and we had a John Deere party for him that year! ), so he was ecstatic about the chance to sit on this big green machine (but a bit nervous when Daddy backed away so Mommy could take the picture and not have to 'shop him out of it later! ).